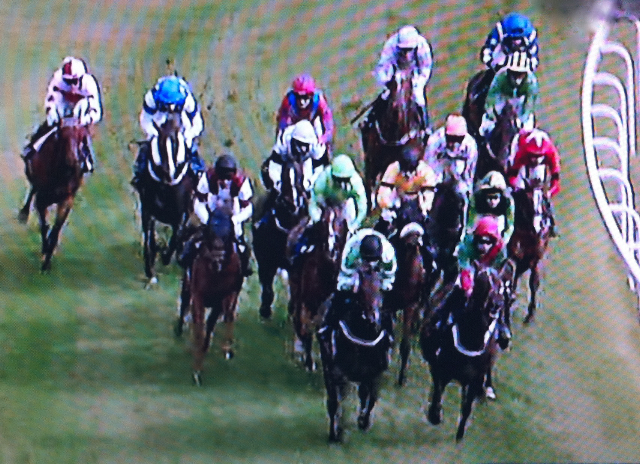 Fifteen runners and riders lined up at Epsom this afternoon for the Tompkins and May Amateur Derby in only its second year of running as a true amateur Derby open to all amateur gentlemen riders which provided a vintage race. 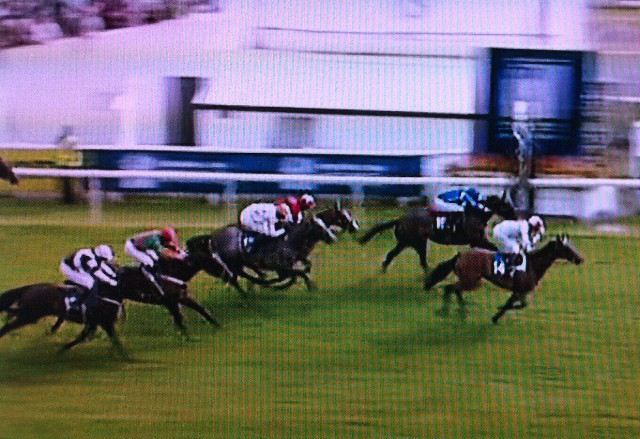 Many congratulations to Phil Collington and Lucinda Featherstone on their great victory with Maybe I Wont. Phil, along with the other eventual placed horses, played a waiting game and tracked the front runners until turning for home. 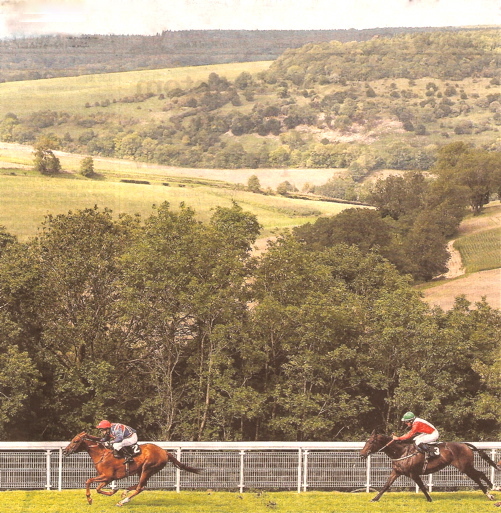 Pictured (top) rounding Tattenham Corner, Phil (on the outside in maroon and white) bides his time to come with a run and storm clear in the last few strides to win, giving trainer Lucinda Featherstone a memorable 1-2 with stablemate Arashi 2nd ridden by her son Jonathon, and King’s Masque and Robert Williams in 3rd. Unstoppable Serena can’t stop winning! Serena Brotherton has beaten her own record number of winners in a season with an incredible strike rate this year, scoring this evening at Carlisle with her 7th winner of the campaign. Having won the lady amateur flat championship in 2005 (5 winners) and 2006 (6 winners), Serena had to wait until last year before reclaiming her title (5 winners). This year she now leads the tables 4 clear of her nearest rival Louise Allan, whilst much remains of the season to look forward to with Epsom for starters hosting the Ladies Derby tomorrow night. Good luck to Serena and to all the ladies! It was also good to see seasoned campaigner Simon Walker back in the winner’s enclosure in the first division of Carlisle’s amateur race tonight. This was only Simon’s second winner this season which has been unusually quiet for him but no doubt he has plenty in store for us before the season is finished. 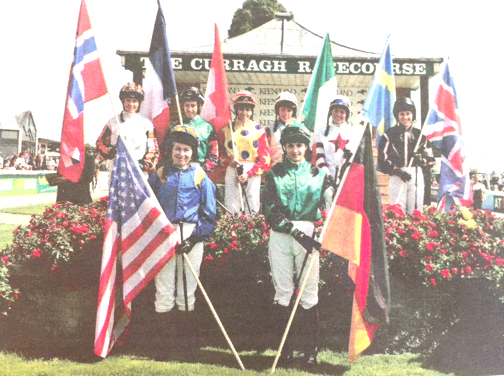 Recently pictured at The Curragh, Ruth Jefferson currently leads the Fegentri Ladies World Championship tables. Not only do we have our own Epsom Amateur Derby for ladies on 19th August and for gentlemen on 30th August but Ireland are now hosting their own Amateur Derby on 11th September at The Curragh. “We are very grateful to the Curragh for agreeing to stage the first Amateur Riders Derby, which will raise the profile of our association and give riders a huge trill to be able to take part in a race on such a prestigious day” said Ross O’Sullivan, Chairman of the Qualified Riders Association. The County Kildare venue already stages the Dubai Duty Free Irish Derby, Derrinstown Stud Apprentice Derby and Thalgo Ladies Derby. Congratulations to Clare Wills who rode a fine race to score on Massina Man against professionals in the 2 and a 1/2 mile novice chase at Newton Abbot today. In spite of the horse making a terrible mistake at the 12th fence, Clare kept him motivated to go on and win by a neck! Clare has been assistant to trainer Brendan Powell since the day she left school – the same day that Brendan started training – and deserves every success for all of the hard work she puts in. Second this afternoon at The Curragh in the ladies Fegentri race, Ruth had non-nominated Fegentri riders both in front and behind her in 1st and 3rd places (Nina Carberry winning the race) and therefore her 12 points scored for the Fegentri series increases her world championship lead in the tables. Many congratulations to Ruth on a great ride on an outsider this afternoon. and must deposit £1500 of this by 15th September via the AJA. The outstanding £1500 must be paid by 8th October to enable the rider to take part. for any reason will forfeit any sponsorship monies already lodged. Ruth Jefferson heads the Fegentri ladies world championship tables after Deauville! A busy weekend in Deauville ended with Great Britain’s Ruth Jefferson heading the ladies table having been placed 4th in the ladies race on Saturday and 3rd in the ladies race on Sunday. She now travels to The Curragh this Sunday where she rides the 25/1 outsider in a field of 10 runners but the points are currently close between the top five girls: Ruth for Great Britain on 133; Pauline Boisgontier for France on 127; Nina Wagner for Germany on 117; Tina Henriksson for Sweden on 107 and Cathrine Engebretsen for Norway on 103. Ruth also rode in the Fegentri World Cup of Nations on Sunday where she was 4th. Meanwhile Harry Challoner is lying 3rd in the gentlemen’s table for Great Britain. The gentlemen’s world championship is headed by Florent Guy for France who cannot be beaten with 207 points already accumulated, but there is a challenge for the runner-up slot. Paul Power for Ireland currently lies in 2nd place with 76 points and Harry has done well to accumulate 45 points already considering that he did not receive an invitation to ride in either Belgium, Spain or Auteuil, France. 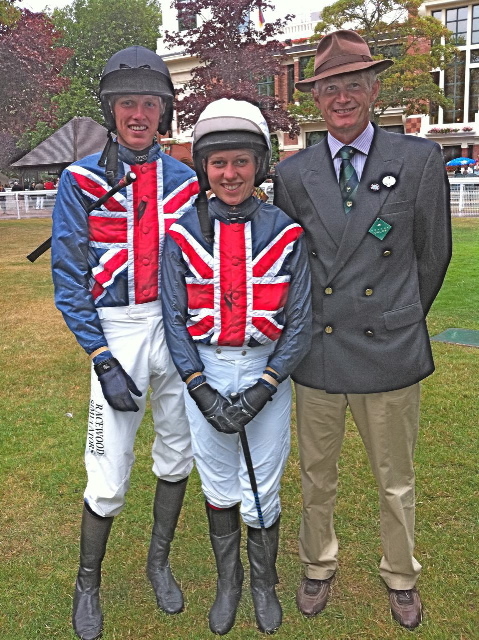 Harry finished 3rd in the World Cup of Nations on Sunday and he is photographed above with Ruth and AJA Vice-President Dr Philip Pritchard. Unfortunately both the Irish and French Fegentri gentlemen riders picked up bans in Clairefontaine on Monday. As a result, and in order to comply with Fegentri ruling of 3 nominated riders’ participation, we have cancelled Fegentri involvement with the AJA Handicap Hurdle scheduled at Stratford-upon-Avon on Thursday 19th August. Although our race is published in the Racing Calendar (No 29 p 52 race no 50365), the race conditions for this race will be changed to a normal amateur rider’s race with the usual Safety Factor and there will be no ballot. We very much hope that you will be happy to support us, particularly now that this race is not restricted to invitation-only jockeys, and we hope to see you at Stratford.